The SuperDOM is highly visual by design but can also be customized to each trader's preferences. You can access the SuperDOM properties dialog window by clicking on your right mouse button within the SuperDOM border and selecting the menu Properties. 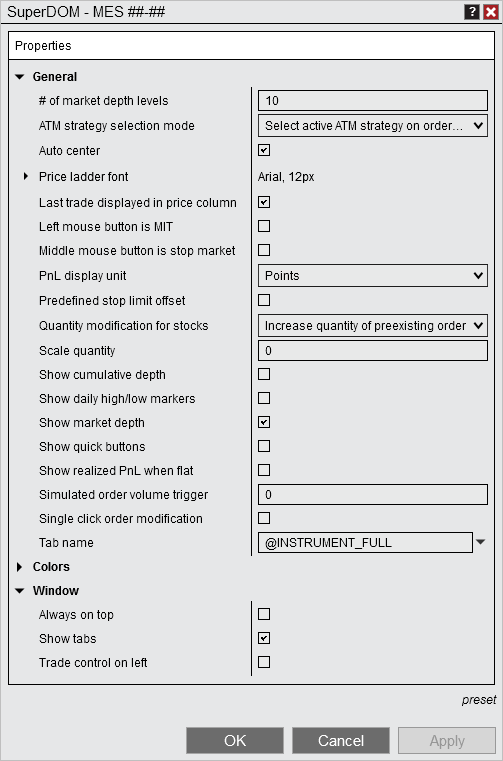 Sets the offset the limit price is away from the stop price for entry/exit stop-limit orders. Set to 'Off' to disable single click stop-limit order submission. Once you have your SuperDOM Properties set to your liking, you can left mouse click on the preset button, then click save. Presets will be applied to all windows of that type opened in the future. If you change your settings and later wish to go back to the original factory settings, you can left mouse click on the preset button, then click restore to return to the factory settings. A number of pre-defined variables can be used in the "Tab Name" field of the SuperDOM Properties window. For more information, see the "Tab Name Variables" section of the Using Tabs page.